The season is here when we all start heading outdoors for camping, hiking, mountain biking and other outdoor activities that could bring us eye-to-eye with deer ticks, that nasty little bug that brings with it Lyme Disease. May is Lyme Disease Awareness month and a good time to share information about staying protected from ticks in the coming spring/summer months. Lyme disease has now become one of the fastest growing epidemics to date. The CDC estimates the number of cases in the US to be about 300,000 cases a year. Here are a few good things to know in order to stay protected. 8. Ticks can be active even in the winter and are not killed by freezing temperatures. 7. Ticks carry disease-causing microbes and tick-transmitted infections are more common these days than in past decades when tick bites were an annoyance but now are more likely to make you sick. 6. 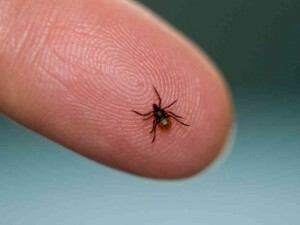 Only deer ticks transmit Lyme disease bacteria. The only way to get Lyme disease is by being bitten by a deer tick. 4. Deer tick nymphs look like a poppy seed on your skin. They’re easy to miss, their bites are generally painless, and they have a habit of climbing up (under clothing) and biting in hard-to-see places. 3. The easiest and safest way to remove a tick is with pointy tweezers. Grab the ticks right down next to the skin. The next step is to simply pull the tick out like a splinter. 1. Tick bites and tick-borne diseases are completely preventable. There is really only one way you get a tick-transmitted disease and that’s from a tick bite. Reducing tick abundance in your yard, wearing tick repellent clothing every day, treating pets every month and getting into a habit of doing a quick body scan are all great actions for preventing tick bites. Insect Shield Tick Repellent Apparel Insect Shield’s EPA-registered technology converts clothing and gear into effective and convenient insect protection. The repellency is long-lasting and appropriate for use by the entire family with no restrictions for use. Products include apparel, gear and even equestrian and pet products.